Have you ever wondered where all that water goes during heavy rainstorms, or once all the snow melts at the end of winter? On most homes, it doesn’t run directly from the roofing to the ground. Instead, it first routes through a series of gutters and downspouts to direct the water away from basements, decking, and other surfaces before it touches the ground—this prevents it from seeping into your home and creating water damage. As long as your gutters and downspouts are operating properly, you don’t have to worry about water pooling and leaking onto areas it shouldn’t. But gutters and downspouts don’t perform properly without regular maintenance—and that’s why it’s important to learn what steps you need to take each year to keep them working efficiently. One of the most important tasks for maintaining the series of gutters and downspouts around your home is keeping them free of leaves, branches, clogs, and other debris. If you’re willing to take the time to clean out the system, it will function properly and help keep your home in good shape throughout the year. Gutters that aren’t cleaned properly will eventually clog, causing water to flow over top of them and onto your home. This can cause damage to different sections of your home and even lead to harmful leaking inside. In addition to checking for rainwater fill-up, it’s important to keep an eye on gutters for ice dams and leaks during the winter, which should be serviced by a professional. 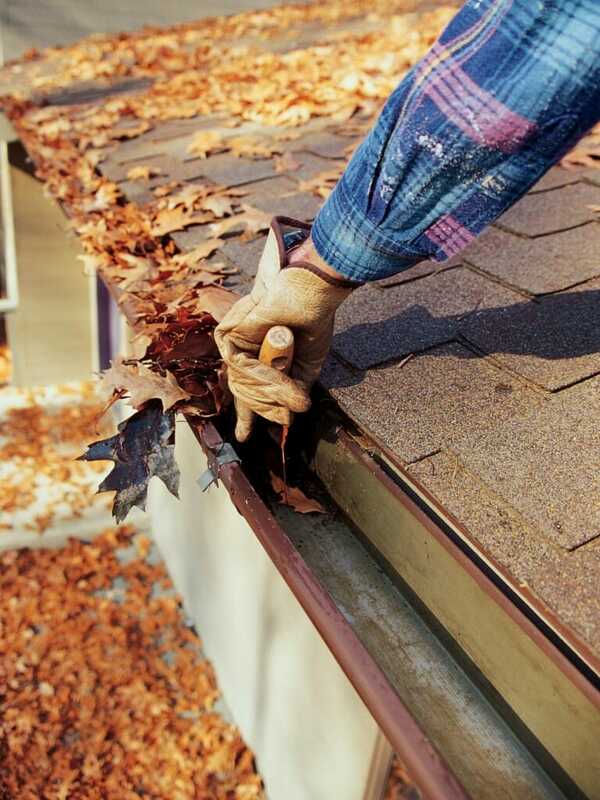 For most homes, a twice-yearly cleaning of gutters and downspouts will do—once near the end of spring, and again as fall draws to a close and the leaves have fallen. These are the primary times when clogs occur and when you can do the most good for your home’s gutters. However, if you live in a particularly wooded area, a more frequent check for debris is advised. Cleaning out gutters and downspouts is relatively simple, but you have to be comfortable using a ladder. Climb up on a ladder set on the side of your home and scoop out any debris you find in the gutters into a bucket, continuing until all debris is removed from the gutters. To finish, use a garden hose equipped with a spray nozzle and flush out the system to remove any excess or stuck debris. After cleaning, you’ll want to check for additional problems. When you flush the system with water, look for any leaks or pools. If the water flows naturally without slowing at any point, you’re finished with your gutter maintenance. Pooling water signifies a blockage somewhere, and leaking means that there’s a hole or a failed seal in the system. Water pooling at the beginning of a downspout means you have a clog going down the tube—and this is a serious issue that must be addressed. Utilize a plumber’s drain snake or auger to go through the downspout and break up the clog. Run the line through the downspout several times at different angles, wiggle it around, and turn the line at locations where you notice any pressure—this is most likely the site of the clog. After cleaning out the spout using your snake, run fresh water through the downspout to push out the now-loose debris and free up the passageway. If no water pools during the flushing process, you’ve successfully cleared out the blockage. With years of wear and tear, holes will eventually develop in either your home’s downspouts or gutters—and the only way to locate them is by using the flush trick to get water flowing through the system. When you do this, have someone watch along the gutters for any potential leaks. If you notice any leaks along the way, make note of their locations for later inspection. Over time, it’s very common for pinholes—caused by rust and corrosion—to develop in a gutter or a downspout. These aren’t a huge issue as long as you can locate them effectively so that you can seal them up. The holes can be closed with simple roofing cement, and it’s good to keep some on hand at all times. To seal the holes, clean them off using a stiff wire brush and then apply a small bit of roofing cement over the hole. Use a putty knife to smooth over the application so that water and debris can flow smoothly without anything catching on the location as it moves. When dealing with larger holes in the gutters of your roof system, you’ll want to patch the problem area with metal flashing. Clean out the area several inches around the hole thoroughly with a stiff wire brush so that the roofing cement can adhere properly. 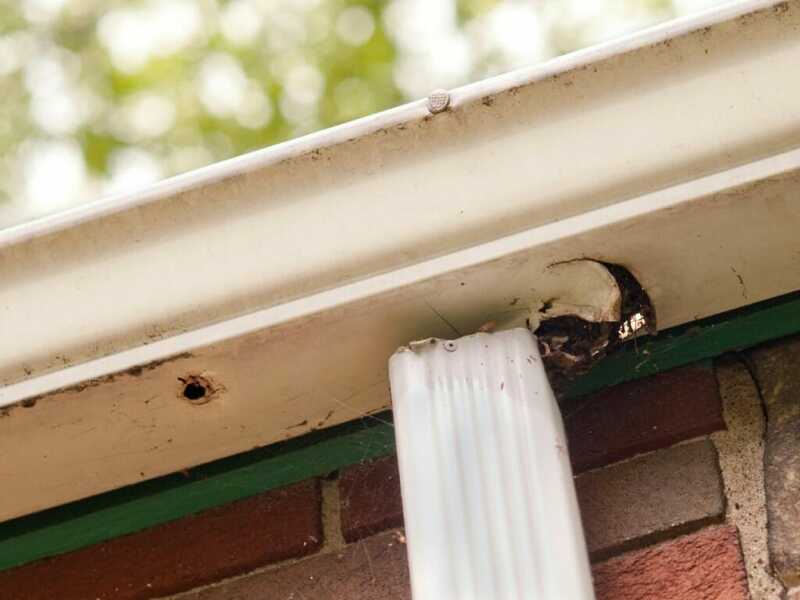 Now take the roll of flashing material, preferably made from the same metal as your gutters to prevent corrosion, and cut to size so it’s a couple inches wider and longer than the hole. Set the patch in place on the inside of the gutter and seal it in two different locations. First put roofing cement under the patch and press it firmly in place to lock it into position and to keep debris from running under the patch. Now put a line of roofing cement over top of each of the outside seams of the flashing patch and use the putty knife to feather the cement. Use the cement to create a ramp that’s flush with the gutter on one end and goes up over the patch and then down flush with the gutter once again. The water and debris should flow over the patch freely without catching or running underneath it. If you get a large hole in a downspout or an elbow connection of your system, it’s better to just replace the section than trying to replace it entirely—not to mention faster.